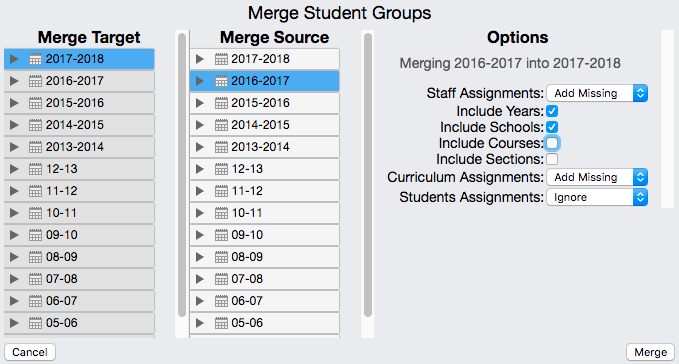 The Student Group Editor allows you to manually assign and unassign existing students and staff, link and unlink grades and curriculum, access any student group from within the same dialog, merge staff, students, and curriculum assignments between groups, and also delete a group. There are two different ways to access the Student Group Editor. To access the Group Editor dialog, simply hover over a group and click on the i. From within the dialog, you can access any other group on the left, and even edit multiple groups before saving your changes. When changes are made, the group directly affected will be displayed with a green solid border and its associated groups higher in the hierarchy with a dotted green border. The actual changes being added will be highlighted in green, and anything being removed will display in red with a strikethrough until changes are saved or cancelled. To Save your changes, you can either click on Apply Changes - to save the changes and remain in the edit dialog, or Apply and Close - to save the changes and close the dialog. Click on Cancel to get out of the dialog without saving any changes. Select the student group you're interested in. Below the Staff List on the left (in the first column), the Info button will show. Year Info button shows when a Year is selected. School Info button shows when a School is selected. Course Info button shows when a Course is selected. Section Info button shows when a Section is selected. The 'Locked' feature is available at the Year, School, Course, and Section levels. When checked, it will not allow any data entry therefore, it is mostly used at the Year level, to prevent anyone from entering or editing any data entered in previous years. When a student group is marked as 'Locked', a small lock icon will be displayed. Automatic Updates refer to the VCAT Import used to update students and teachers assignments. When checked, this feature will allow a student group to not be modified in any way when running the VCAT Import. This feature is available at the Year level. Each term used in your system require a date range; a beginning date and an end date. Consecutive terms (eg Semester 1, Semester 2) should have no gap between the end date of one term and the beginning date of the next one. Click here for more details on Terms. You can view staff assigned and also create new staff assignments from every info dialog levels. 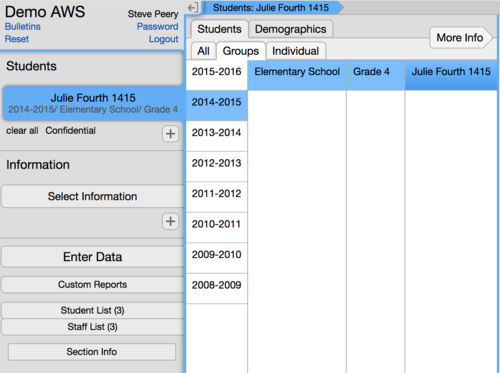 In the Edit Year Info dialog, you will see staff assigned at the year level - which includes students in all schools in the SU/SD. In the Edit School Info dialog, you will see any staff assigned to that school, and staff assigned at the year level as well. In the Edit Course Info dialog, you will see any staff assigned to that course, and staff assigned at the school level and at the year level as well. In the Edit Section Info dialog, you will see any staff assigned to that particular section and staff assigned at the course level (course that this section is part of), at the school level and at the year level as well. Start typing part of the first or last name of the staff you wish to assign. Select the staff from the list that pops up. By default, a role is listed to the left of the Create Assignment button. If this role is the one you want, you can click on Create Assignment to add this new assignment. Otherwise, click on the up/dow arrow to choose a different role that is more appropriate and then, click on Create Assignment button. NOTE: If the role you wish to use doesn't exist yet, you will need to create that role first. After the new role has been created, you may have to log out and log back in to have it show up as a choice in the list. The new assignment being added will be highlighted in green until the change is saved. You can repeat this process to create more staff assignments, within this student group or any other ones you can select on the left side of the dialog. When you are done, click on Apply Changes or Apply And Close to save all the changes you made. To remove/delete a staff assignment using the Student Group Editor, you need to be at the level you wish to make the change. Be on the Edit Year Info dialog if you wish to delete a staff assigned at the year level, be on the Edit School Info dialog to delete an assignment at the school level, and so on. Where Assigned Staff is listed in the dialog, click on the in front of the staff assignment you wish to remove. The assignment will then be highlighted in red, with a line across it. You can remove multiple staff assignments, within this student group or make any other changes in other student groups listed on the left side of the dialog. When you are done, click on Apply Changes or Apply And Close to save all the changes you made. Hit Cancel if you don't want to save your changes and get out of the dialog. This feature is available at the Course level, in the Edit Course Info dialog. The Linked Curriculum Courses section lists the curriculum that is linked to the course you have selected. The Add or Remove Curriculum allows you to link other curriculum or unlink existing curriculum linked. For more details on how to Add or Remove Curriculum links, please click here. Students are assigned to sections so you will see Assigned Students in the Edit Section Info, when you have a section selected. IMPORTANT: If the student assignments are normally updated when running the VCAT Import, the importer will override student assignments done manually next time it is run if those assignments are not part of the import file(s) UNLESS the section is marked as 'Ignores Automatic Updates'. 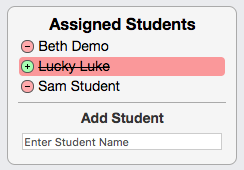 In the Enter Student Name field, type in part of the first or last student name. Click on the student name in the list that displays. Once selected, the student will be added to the Assigned Students list and will be highlighted in green to indicate a change that has not been saved yet. Multiple students can be added, and any other changes needed can be done from within this dialog and saved once, before leaving the dialog. When done, changes can be saved by clicking on Apply Changes (the dialog will remain open) or Apply And Close (will close the dialog). A student assignment can be removed by clicking the in front of the student name. If you change your mind and no longer wish to remove that student assignment, you can click on the green plus sign in front of the name. Multiple edits can be done within the Edit Section Info dialog. You can wait for all the changes to be taken care of before saving them all at once before leaving the dialog, or save as you make the changes. You should NEVER have to delete a school year or a school, unless you mistakenly created a new one and wish to get rid of it. When the VCAT Import is run to update the students and teachers assignments, it can leave courses and/or sections empty; no student nor staff assigned. MAKE SURE THE COURSE AND/OR SECTIONS HAVE NO STAFF ASSIGNED AND NO STUDENT ASSIGNED BEFORE DELETING! A course having only an empty section (no student nor staff assigned) can be deleted in the Edit Course Info dialog by clicking on Delete Course Info button. Deleting a course will also delete its section(s). 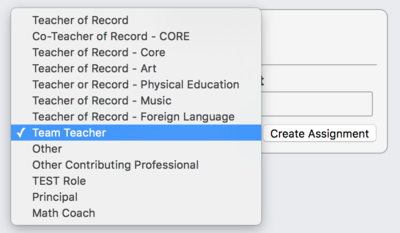 An empty section (no student nor staff assigned) can be deleted in the Edit Section Info dialog by clicking on the Delete Section Info button. 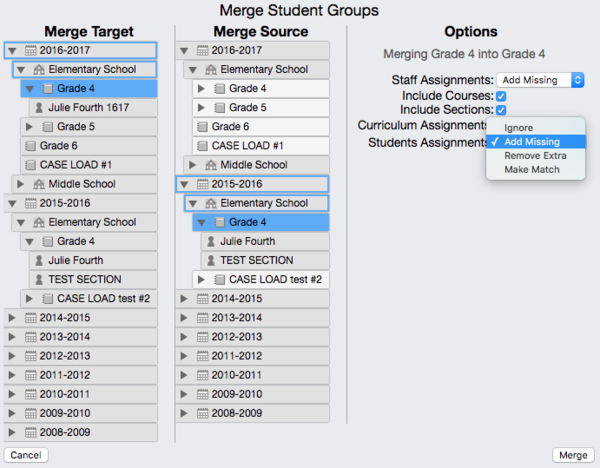 The Merge feature is available at the Section, Course, School, and Year level, and each level offers options. For Staff, Curriculum, and Students assignments, you have the choice to Ignore, Add Missing, Remove Extra, or Make Match. The next screen gives you, in writing, an overview of the effect of the Merge. Click Continue to visually see highlighted in green where and what the changes are. Review all the changes and edit any of them if need be before saving them. 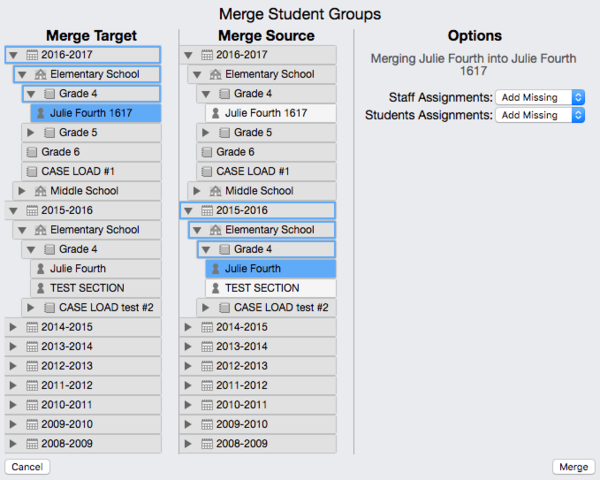 There is NO way of undoing a merge without having to manually editing everything that has changed. A Cancel button is also available if you wish to get out without saving any changes. The VCAT Importer takes care of assigning the primary teachers (Teacher of Record) and students to groups. It doesn't assign to groups any other teachers or staff that have roles like Principal, Literacy Coach, Team Teacher, Co-Teacher of Record, ... Instead of completely taking care of these types of assignments manually, one by one, the Merge feature can be use to facilitate this process. Select the new year first - this is your target. 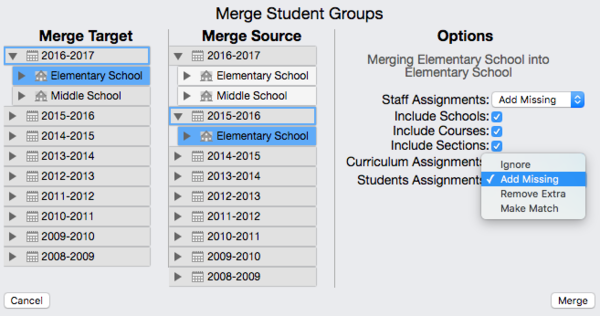 Under Select Merge Source, click on last year to have it become the source of the information that will be transferred to the new year. Set the Options to say 'Add Missing' next to Staff Assignments, keep the check for 'Include Years' and 'Include Schools' (this will allow for last year's Year and School level staff assignments to come through), 'Add Missing' next to Curriculum Assignments (only if you wish to take last year's curriculum links and apply/adjust them to the new year, otherwise, set it to Ignore), and set Students Assignments to 'Ignore' (obviously, you do not want to replicate last year's students assignments to the new year). 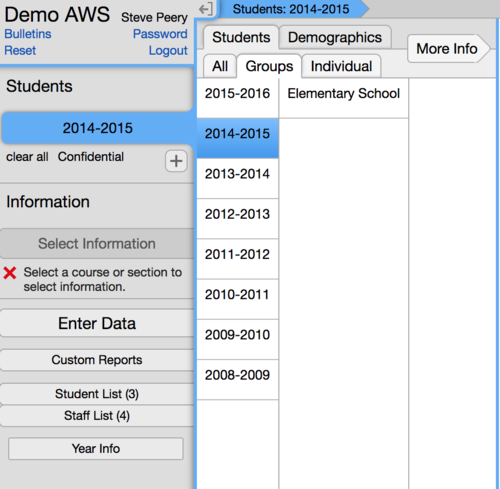 The Student Group Editor is also used for Demographic Groups. 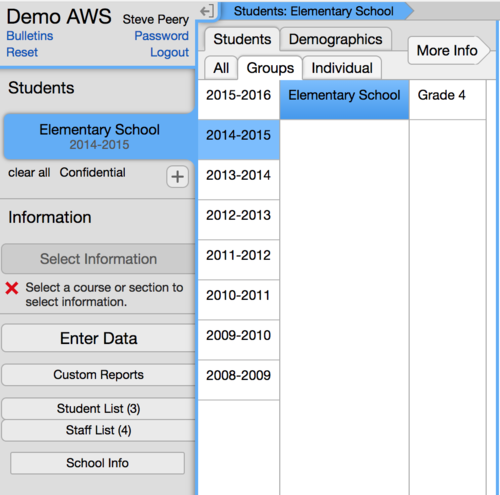 It allows the user to edit Demographic Sets, Demographic Variables, and Demographic Values, and manually update existing students demographics, as well as merging student assignments between demographic groups. DO NOT USE THIS FEATURE if the demographics are updated when the VCAT Import is run. Keep the student demographics up-to-date in your own SIS and this information will come through with the importer. 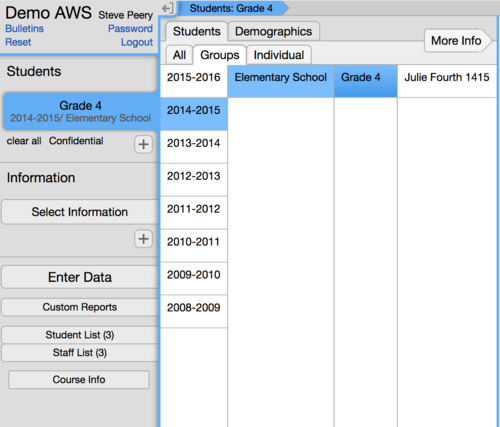 The Merge feature is helpful if you are manually updating students demographics. In the example below, it is merging the students assignments from demographic set 2015-2016 into the one called 2016-2017. Right after clicking the Merge button at the bottom right, an overview of the changes are presented in a word form. Just hit Continue to better see and understand the changes created by the Merge. When changes are made, the group directly affected will be displayed with a green solid border and its associated groups higher in the hierarchy with a dotted green border. The actual changes being added will be highlighted in green, and anything being removed will display in red with a strikethrough until changes are saved or cancelled. Any edits can still be done before changes are saved. Although the following features are visible and accessible to all Full Access users, they should not be edited. Contact VCAT Support Staff if you have any questions. Code ---> used by VCAT Support Staff. Please, do not edit. School Link ---> used by for VCAT Support Staff. Please, do not edit. Grade Link / Edit Grades / Add Grade ---> Only Grade level courses need to be linked to their respective grade. Used by for VCAT Support Staff. Please, do not edit. This page was last modified on 22 March 2018, at 17:36.